Ousted Chinese politician Bo Xilai listens to his verdict in court in Jinan, Shandong province, on Sunday in this photo released by Jinan Intermediate People's Court. 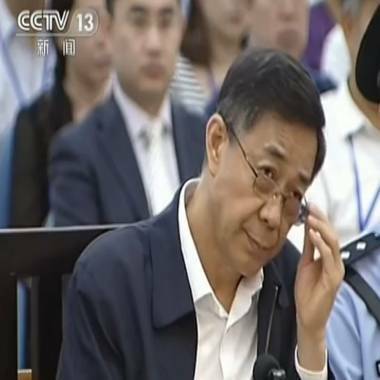 BEIJING – A Chinese court has found former Communist Party boss, Bo Xilai, guilty of all charges of corruption, taking bribes and abuse of power, sentencing the disgraced former official to life in prison. 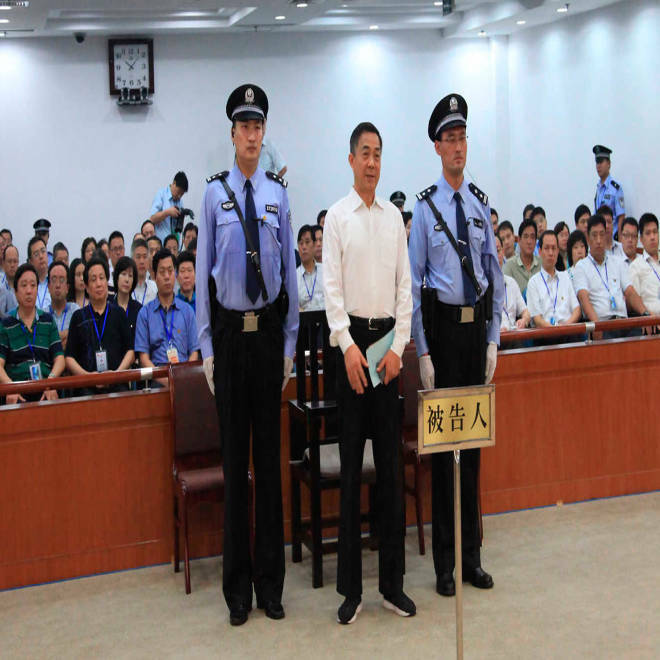 The Jinan Intermediate People's Court in Shandong province handed down the verdict and sentencing Sunday, weeks after Bo’s tumultuous trial concluded last month. The guilty verdict had long been expected, but many in China had wondered whether authorities would hand Bo the death penalty for his crimes. The court also ordered the seizure of all Bo's financial assets, and he was deprived of political rights for life. As the son of one of China’s “Eight Immortals,” leaders of the revolution revered by the Communist Party, Bo was considered a “princeling,” part of China’s most elite class. He quickly ascended up the party ranks, moving from mayor of the major port city of Dalian to commerce minister, to eventually a seat on China’s ruling Politburo. It was in his role as party chief for the southwestern megacity of Chongqing that Bo’s political star truly rose. Bo opened up government coffers to build massive public housing and prestige projects across Chongqing while also launching a “red culture movement” meant to stir national pride in the populace through entertainment -- including “red songs” that glorified China’s ruling Communist Party. But it was an aggressive “Strike Black” crackdown on organized crime – which critics say also targeted his political opponents – that really made Bo a national figure. In the months leading up to China’s once-a-decade leadership change last November, many China-watchers expected Bo to rise and become a strong leftist voice on the mainland’s highest political stage. But Bo’s ascension stopped suddenly in February 2012 when his trusted deputy, Wang Lijun, shocked the world by slipping into the U.S. Consulate in Chengdu. Wang sought protection from American officials, telling stories of a 2011 murder/cover-up involving Bo’s wife, Gu Kailai, and a close business associate, British businessman Neil Heywood. The incident quickly brought about the political demise of Bo, who was summarily stripped of power and put in detention along with his wife and numerous other former associates. In the months since, many of these key characters have been tried in quick, tightly controlled trials. Gu was found guilty last year of murdering Heywood and received a suspended death sentence. Wang, meanwhile, was given a 15-year jail sentence for his role in the murder and for his attempted defection. In contrast to those trials, Bo’s five-day hearing last month was surprisingly transparent given the potential risk for embarrassment from putting such a high-level party official on trial. Transcripts and video from the trial showed a feisty Bo gamely defending himself against charges that he had taken $3.56 million from local Chongqing businessmen. Rigorous direct cross-examination to witness testimony was allowed and Bo ferociously attacked the evidence, earning himself a surprisingly supportive following on China’s Web sphere. The openness of the trial won praise across China, but belied the tight control Beijing actually maintained over the proceedings. Foreign and independent journalists were blocked from sitting in on the trial, and testimony by Bo regarding Party pressure to confess was redacted from the official testimony. Critics questioned whether the transparency of Bo’s trial marked a turning point in the liberalizing of China’s judicial system or if it was merely political theater employed by Beijing to cool public resentment against systemic party corruption. The whole Bo debacle has become an enormous black eye for the Communist Party. As Bo Xilai’s story exploded on Chinese media, lurid details of the extravagant lives led by the Bo clan only confirmed public suspicions of mass official corruption, both at the local and national level. This screen grab taken from CCTV footage released on Aug. 26, shows ousted Chinese political star Bo Xilai looking on as he stands on trial in the Intermediate People's Court in Jinan, east China's Shandong province. Since the party’s inception, China’s Communists have gone to great lengths to carefully craft a public image that underscored its virtuousness and humble roots. With that party myth effectively shattered by Bo’s trial, China’s new President Xi Jinping has made eliminating corruption a key policy in a bid to restore that reputation. Since taking power last November, Xi and the new leadership have launched a substantial anti-corruption campaign that was meant to stamp out dirty officials, whether they were “tigers or flies” -- corrupt officials large and small. To date, the campaign has had mixed results with some high level officials recently being brought down. But many in China are asking pointed questions about whether Beijing is merely attacking the symptoms of corruption rather than the roots of the problem. Prominent critics who dared push for constitutional rule, democratic reform and freedom of the press, among others, have been silenced or detained. Despite that, the movement easily represents the toughest anti-corruption movement in recent Chinese history.